Showtime’s Homeland debuted on the 10th anniversary of the 9/11 attacks on the U.S. The series stars Claire Danes as Carrie Mathison, a CIA operative who’s learned that an American soldier in the Middle East has been “turned” and now works for an Al Qaeda cell. When Marine Sergeant Nicholas Brody (Damian Lewis) is found after eight years in captivity and returns to a hero’s welcome, Carrie is certain he’s the double agent. Since she can’t persuade her dubious CIA superiors to follow her instincts, Carrie goes rogue, setting up an illegal surveillance on Brody’s house and then engineering a personal relationship with him that lets her follow her own course. The series plays the country’s paranoia for all it’s worth, constantly turning the plot to keep viewers and characters off guard. The performers hold their characters’ secrets close; they’re as difficult for us to read as they are for one another to truly understand, even though viewers are given key bits of information early. For instance, Carrie’s surveillance cameras can’t pick up the inside of Brody’s garage, where we know well before Carrie that he retreats regularly for Muslim prayers. Hearing his chanting and seeing him perform the rituals seems chilling, but it later appears that the show’s producers have played on mainstream viewers’ stereotypes about Islam to enhance our sense of foreboding. In a later episode, Brody explains to Carrie that he adopted Islam because he needed religion—any religion—to survive the ordeal of his captivity. Because Lewis plays Brody so convincingly, it’s difficult not to be persuaded and even moved by his explanation. But the most recent episode’s plot twist once again upends our understandings, playing both with and against viewers’ presumptions. Nonetheless, it’s impossible for a series about terrorism not to trade on knee-jerk expectations of which characters will be good and which bad. The Arabic-accented, Middle Eastern-appearing men are instantly marked as villains. The only thing that makes Brody truly interesting is that he’s a red-haired, archetypally American soldier who might, in fact, be working for the enemy. And in a subplot that hasn’t yet been consistently developed, a young Middle Eastern professor and his blonde American wife have moved into a neighborhood that puts them within shooting range of a U.S. military landing strip. The CIA believes the man might be Brody’s Al Qaeda contact, but it turns out that it’s his wife, Aileen (played by the always wonderful Marin Ireland), who is the mysterious operation’s architect. Her back-story gives her ample reasons to love the Middle East and to despise the United States, but her centrality to the series’ plot has so far been tenuous. Even the henchman of Abu Nazir—the archenemy who Carrie suspects is the mastermind behind a new plot to attack America—is nearly strangled when Brody breaks into his house to confront him about his presumed dead comrade, Tom Walker. Homeland invites viewers to watch with a kind of vengeful pleasure as these brown men endure violence meted out by righteous white men. Although the series wants to disrupt our assumptions, its images nonetheless secure conventional ideology about the Middle East as the dangerous, obvious locus of terrorist threats. Danes plays Carrie, the smart, difficult, unruly operative who receives the intelligence that a soldier has been turned and rests her suspicions on Brody. Danes does a wonderful job communicating the obsessions of someone high up in the CIA’s ranks who takes it as her personal responsibility not to let 9/11 happen again. In fact, in Danes’ voiceover on the show’s credits, Carrie insists that she should have caught the clues, that she should have seen the 9/11 attacks coming and been able to prevent them. The weight of personal guilt for a national tragedy fuels Carrie’s passion and her mania. Homeland suggests that only enormous ego or narcissism could explain one solitary CIA agent’s single-minded pursuit of justice and her insistence that 9/11 was in some way her fault. At the same time, the show proposes that another terrorist event might in fact be foiled by a single agent. The show seesaws between these two different desires. It appeases our yearning for a hero who can stop speeding bullets with his or her bare hands (like Kiefer Sutherland as Jack Bauer in 24, on which some of Homeland’s producers previously worked). But it also underlines that national security is a complicated priority that takes way more than a village, let alone any individual. Homeland mostly resists 24’s fantasy that one man could save us all. In fact, Homeland’s hero is a woman. While the show admires Carrie for her superior intelligence and her willingness to dedicate her life to her job, it also burdens her with an unnamed but determining psychological problem. Carrie can’t tell the agency about her condition or she’d be fired from her high-level security clearance position. She pilfers drugs from her impatient, unsympathetic pharmaceutical rep sister to self-medicate and keep herself even. By explaining Carrie’s obsessions as at least partly the result of her illness, Homeland cuts the character off at the knees. We’re never sure if her paranoia is justified or chemical, and none of her reactions can be trusted because we don’t know what really fuels her obsession. 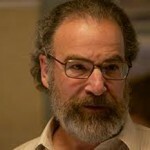 Instead, Carrie confesses her misdeeds to Saul Berenson (Mandy Patinkin), her father-figure mentor. He scolds her, knits his thick eyebrows together in deep disapproval, and then absolves her, hugging her tightly in understanding parental embraces that free her to go on drawing outside the lines of agency protocol. Saul, you see, is also emotionally haunted. His obvious though unnamed Jewishness—inescapable in any character Patinkin plays—emphasizes his moral ambivalence. Like Carrie, Saul’s obsession with his job compromises his emotional and domestic life. In fact, his South Asian wife has decided to leave him after 25 years of marriage to return to her family in Delhi because he’s emotionally and physically inaccessible. Their scenes together allow Patinkin to indulge his hang-dog, maudlin side. The producers haven’t quite figured out how to bring more nuances to a character caught between his righteous ambitions and his sincere love for his wife. Their costly commitments to their jobs make Saul and Carrie the show’s real soul-mates. Damian Lewis performs Sergeant Brody as a time-bomb set to detonate, controlled by unknown forces on an unknown schedule. Brody was isolated for eight years before being rescued by an American SWAT team. Lewis clarifies the force of will required to survive captivity, and never shies from inhabiting Brody’s vulnerabilities. He makes palpable the depth of Brody’s need for connection while he remained in captivity, after he was released from extended solitary confinement and torture. After sustaining himself by making unimaginable moral choices, Brody returns to a domestic life that’s moved on without him. Brody finds that his wife, Jessica (Morena Baccarin), has been sleeping with his best friend, Mike (Diego Klattenhoff). But after being told that Brody was presumed dead, how long was she supposed to keep her life on hold? Likewise, Brody’s friend and fellow captive, Sergeant Tom Walker, whom Brody is lead to believe he killed with his bare hands, left behind a wife who’s since remarried. Both couples have kids who barely know their fathers. One of Homeland’s conversations, then, also concerns the place of biological fathers in families that survive without them. The series implicitly asks whether men like Brody have any right to walk back into their patriarchal roles without acknowledging how their domestic spheres have closed around their absences. Baccarin, as Jessica, plays Brody’s conflicted wife with emotional depth and precision. She’s given little to do—wouldn’t a soldier’s wife have to work for a living when he was presumed dead?—and she mostly reacts to Brody’s presence. But Baccarin communicates the complicated feelings of a woman who has to pick up a marriage that was suspended and presumed ended for eight years. Her struggle to play the dutiful, faithful wife makes Jessica more interesting in Baccarin’s performance than she is in the show’s dialogue. Homeland’s latest twists (Episode 9) stretch the credulity of an already somewhat confusing story. (I’ve noticed the on-line concern that the show might go the way of The Killing, last season’s atmospheric new series that finally irritated viewers with its cliff-hangers and unlikely plot turns.) But I’ll keep watching to see how Danes continues to bring depth and complexity to one of the more interesting roles for women on series television, and to see how the writers unravel the current host of secrets and complications and set us up for more in season two. Hi, I’m interested in discussing the show with a feminist intellectual such as yourself. I just started the third season and it seems the Islamaphobia has been amped up. While in the first two seasons the “binary” that you discuss here was messed with– the second episode with Saul’s confrontation of the young muslim woman in Hijab is pretty hard to swallow without gagging. what do you think? i still am mesmerized by Danes. It’s fascinating to compare good (feminist) and ill (anti feminist) impulses here in a contrast between Carrie and Jack Bauer. Bauer-n epitomizes invulnerabily masculinity while Carrie’s figure is in cross-hairs of epitomized feminine (as opposed to female) vulnerability and yet action-figure power of some sort. Thoughts? also- any thoughts on the casting-decision of Morena Bacarrin for Brody’s wife–given the extent to which she presents as Arab (easily enough). more messing with the Binary?